Mt Whitney is, of course, the highest peak in the USA 48 'mainland' states at 14,495'. This is the view from the top of Mt Langley (14,042') (HA! I told you I've been there). 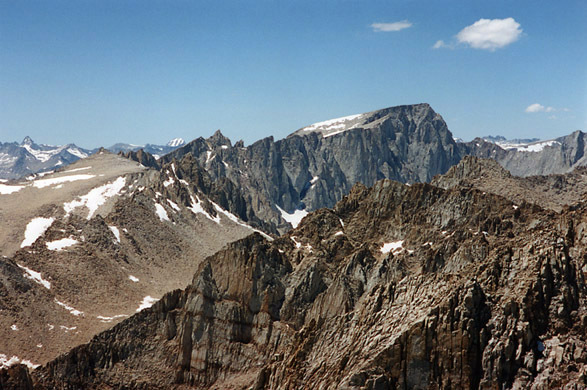 To the left of Mt Whitney are many fourteener needles, culminating at Mt Muir (14,015'). At the extreme right is Mt Russell (14,086'). Kinda fun, looking out over those 'little' thirteeners in the foreground, eh?